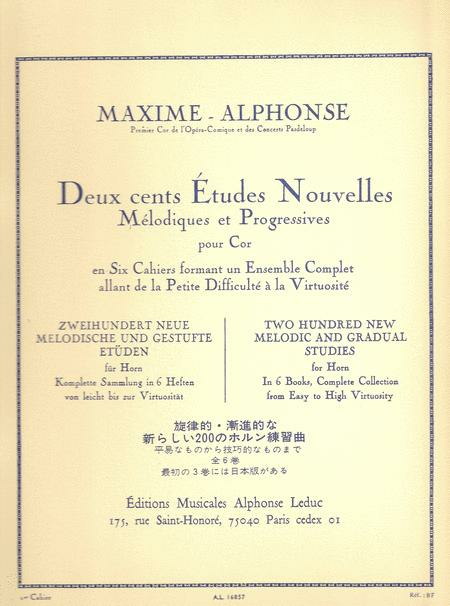 Composed by Alphonse Maxime (Jean Marie Maximin François Alphonse, known as Griet, 1880-1930), Deux cent études nouvelles, 1ere cahier is the first book of a set of six, containing 200 études for horn with different levels of difficulty. 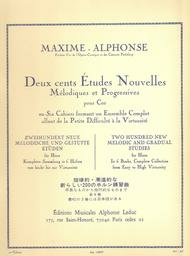 As a horn teacher who had also won the Premier Prix in Horn at the Paris Conservatoire, Alphonse Maxime wrote this set progressively to ensure that the content matched the need for quality studies, starting with pieces for beginners, and evolving through the books to those for advanced students. Even though little information can be found about the composer, this set of six books is essential for playing contemporary horn.